To serve a bigger group, this side salad can easily be doubled. Good thing, too, because its sweet, earthy flavor is a real crowd pleaser. down, and lightly grease the foil with oil. Arrange the cabbage slices on the sheet, and brush with 1 Tbs oil. Broil until the edges are nicely charred, 12 to 14 minutes. Transfer to a medium bowl, and season to taste with salt and pepper. Allow to cool completely. In a medium bowl, combine the pears with half of the scallions, the brandy, vinegar, the remaining 1 Tbs. oil, and the caraway seeds, and toss. Transfer the cabbage to a platter. Top with the pears, and sprinkle with the pecans, zest, and remaining scallions. What a surprise! 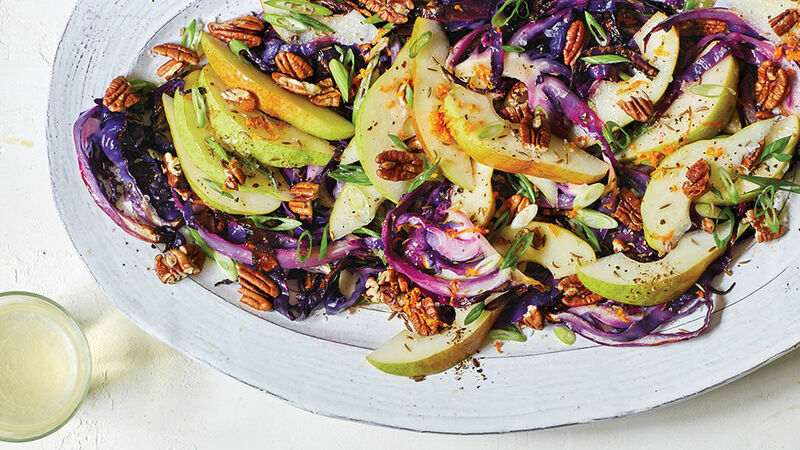 LOVE the roasted cabbage under the broiler, and with the pears and (in my case) toasted almonds. What a wonderful dinner. Could work well with perhaps some salmon or tuna if you wanted more than a salad. You really should try this! Oh my...what a hit!!! Absolutely wonderful! Didn’t change a thing! Very good even though I didn’t have pear brandy. Noice texture with the crispy cabbage and nice pears and pecans. I served it with a corn chowder which was light, no cheese.